Spring is a beautiful season. The fresh smells, the sounds of the birds singing, the sprouts of new growth and the scurry of new activity are all signs of the season. The lengthening days allow for more time to explore, but remember this is also the time for the ticks to come out of hibernation. Ticks are becoming more and more prevalent, and the diseases they carry a world-wide crisis. Climate change is also assisting their encroachment into new areas, along with the diseases they carry. A Red-winged Blackbird picks off engorged ticks from the head of a White-tailed Deer. 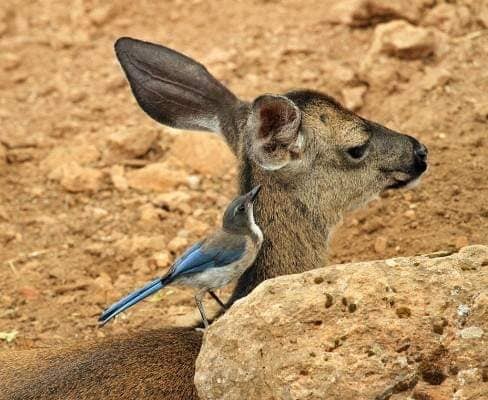 Both bird and deer benefit as the bird gets a meal while the deer gets parasites removed. This is an example of a symbiotic relationship (Photo by Naomi Ballard). Ticks hibernate over the winter, however every year migrating birds bring more tiny ticks into our area. Mammals such as deer and moose can carry thousands of ticks to new areas as well. Every fall, each female can lay up to 3,000 eggs. Ticks can come out of hibernation when it as warm as 4 degrees Celsius. When you head out on the trails, prepare by wearing a repellant high in deet. By wearing light clothing you can spot a tick easier, and by tucking your pant legs into your socks, you can prevent them from climbing to unwanted areas. Black-legged Tick (Photo by Kimberly Epp). A Deer Tick nest with and adult and thousands of tiny eggs. These eggs are laid each fall, often under leaf litter. We have two species of ticks in Saskatchewan - the Wood (or Dog Tick) and the Deer (or Black-Legged Tick). Ticks have a shell-like exterior and bury their heads into hosts to get their tasty blood meals. Deer Ticks can be as small as freckles, and are an invasive species. Ticks live in habitats frequented by potential mammal hosts. Ticks hang onto grasses and wait for a passing mammal to approach them, whether it’s a human, a pet or a wild animal. These parasites cannot fly. A Western Scrub Jay cleans the ticks off of this deer (Photo by Vicki Miller). Ticks can hide within your pet's ears, foot pads and even inside their mouth - so it is important to check these areas. The only safe way to remove a tick is by tweezers. Pet stores and veterinary clinics sell ones specifically for your pet. Giving your dog preventative medicine before going out and into long-grassed areas is the best thing you can do for them. Ticks carry serious diseases for pets and wildlife as well. Lyme disease and other co-infections can be transmitted to pets as well as wildlife, mostly found within Deer Tick populations. 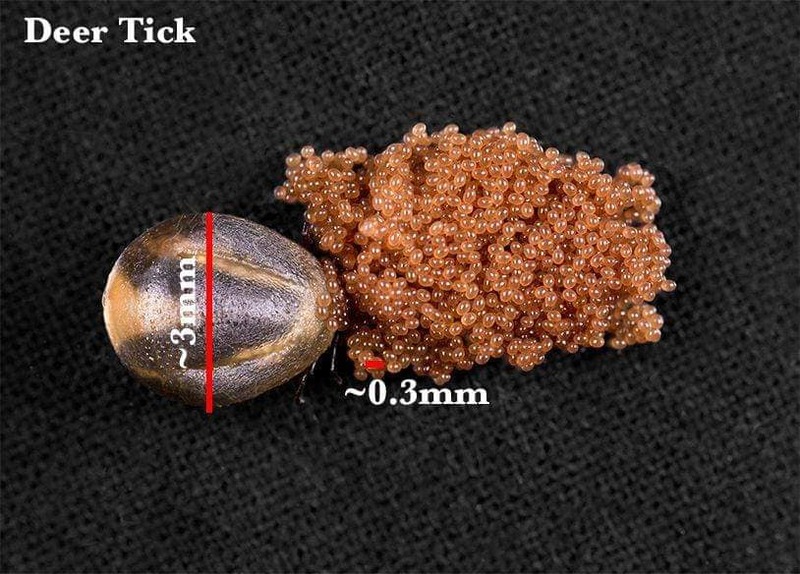 An engorged tick found on a dog (Photo credit unknown). Some bird species may lend a helping beak to a mammal in need. The Brown-headed Cowbird, a local example, will pick ticks off of larger mammals such as deer, moose and cows. The deer (or cow) realizes that the birds are just helping them, and take no issue in becoming a feeding platform. The birds get a fresh, rich blood meal within a tasty tick that once engorged, has a soft shell. These animals help each other out, and this is referred to as a symbiotic relationship. Symbiotic relationships are actually quite common in the animal world. 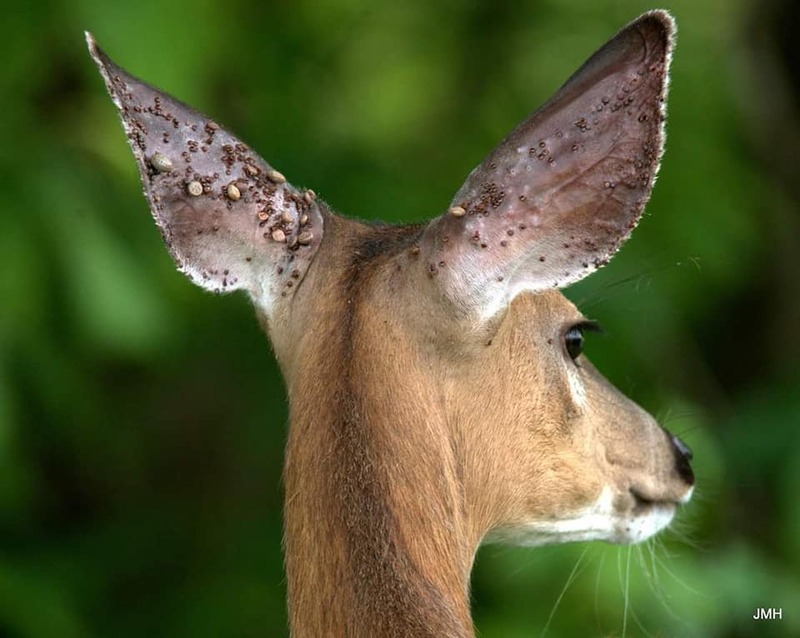 White-tailed Deer with countless ticks, some engorged and latched onto its ears (Photo credit unknown). If you come across a wild animal with engorged ticks, call the Wildlife Rehabilitation Society of Saskatchewan's wildlife hotline at (306) 242-7177 for advice on what to do. They may ask that you bring the animal (if it is small) to a wildlife rehabber in your area. Dr. Melanie Blager is from "Wild and Cared Free Wildlife Rehabilitation" of Moose Jaw. They may give advice on if/how to catch the animal. Usually then they will advise you to put it into a dark box with rags, towels or blankets - and to keep the box away from pets or children. Otherwise you can give the location of the animal, and this information will be passed on. Small mammals are most susceptible to ticks - and can die from the blood loss. 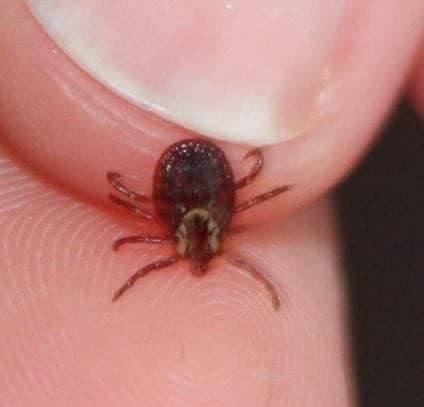 Animals cannot usually remove the ticks by themselves, and so have to wait until they fall off (after the ticks are fully engorged) or get eaten off by a bird. Cottontail Rabbits and baby skunks are common victims of ticks. Ticks often feed off of the blood within the veins in the ears of these mammals. Larger mammals, such as moose have been found with well over 10,000 ticks. The moose rub their bodies against trees to try and rid themselves of the ticks, thus causing fur loss. This is where the term "ghost moose" comes from. They appear lighter in color, and almost "ghost-like". Epp is an Environmental Educator and writer and is also President and Field Trip Coordinator for the Moose Jaw Nature Society. She can be reached at kepp@shaw.ca. Stay tuned for upcoming articles on feeders for pollinators and upcoming Moose Jaw Nature Society programs.